In a bowl, use a wooden spoon to soften the blue cheese. Combine the chopped almonds and walnuts together on a plate and put aside. Press the cheese onto the peaches with a knife. Then dip the cheese into the chopped nuts. 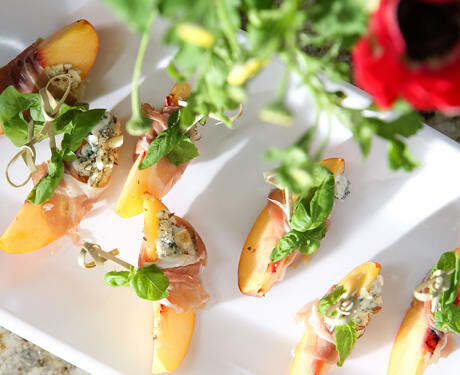 Wrap peach slice in a piece of prosciutto and sprinkle with freshly ground black pepper. Skewer each peach and garnish with a basil sprig. 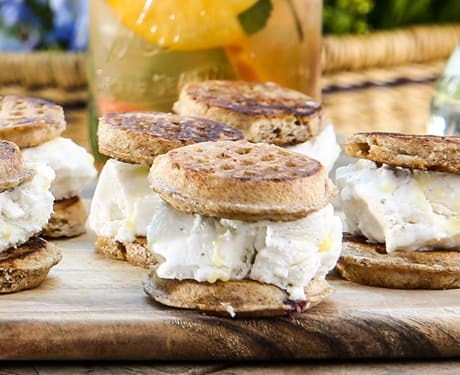 Toast the waffles then break into individual pieces. Place 8 - 10 waffles on a platter. Place one scoop of ice cream on half of the waffles. Place another waffle on top. Drizzle with olive oil. Sprinkle with Maldon sea salt. Serve immediately. 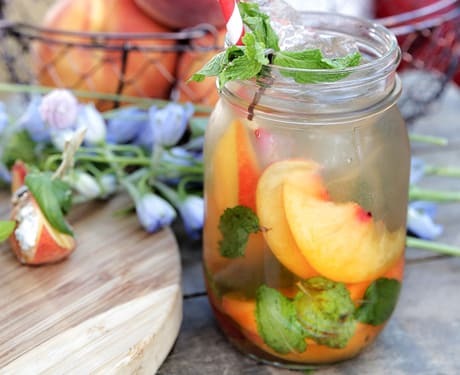 In a mason jar, muddle peach, mint and lemon. Stir in water, simple syrup, whiskey. Garnish with a peach slice and mint sprig.